Whew! I’m glad that’s done. I have one more “Dublin Murder Squad” story and I’m caught up. There have been 5 – this was #3 and I’m still missing #4, The Likeness. This books in this series don’t need to be read in sequential order because they’re about various detectives on the Murder Squad – they work quite well as stand-alones. I’ve enjoyed the others in this series quite a lot, but this one? No. Frank Mackey is a divorced detective with a 9-year old daughter and a rather uppity ex-wife. Mackey is from a very bad background from whom he has deliberately distanced himself. One day his sister calls for help – an old suitcase was found in their parents’ chimney. This leads to a really interesting crime story and a really stupid relationship dilemma. I guess the story needed fleshing out with something, but the father/daughter/mummy relationship thing got very old. 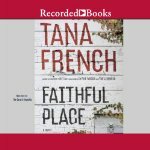 I don’t know if I’ll read more Tana French novels. We’ll see. Into the Woods (2009 or so) – rating was probably a B because I was in no rush to read more.